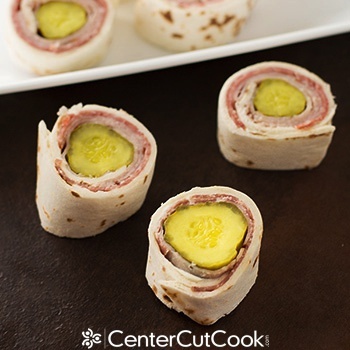 Delicious ham, pickle, and cream cheese rollups are perfect for an appetizer or snack! When I first started dating Ryan, his family introduced me to an appetizer that tends to make an appearance at most family parties: dill pickles covered with cream cheese and wrapped with dried beef, also known as Dried Beef Pickle Roll-Ups. At first I wasn’t crazy about ’em, but before I knew it, I was as addicted to these little things as everyone else in his family. They’re sort of tedious to make, however, and I’ve only ever made them a couple of times myself. Because of this, I was excited when I threw together these easy ham and pickle rollups on a whim one day, and we realized they taste just like the aforementioned dried beef and pickle roll-ups! 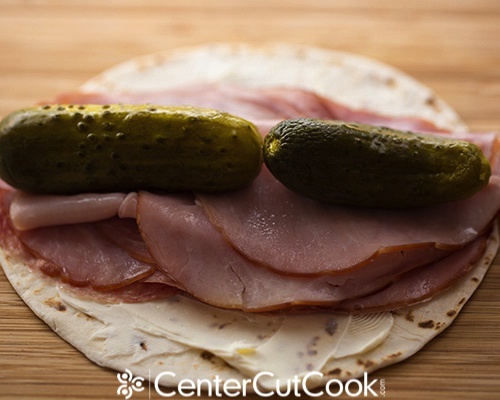 Meet the ham and pickle rollup. As I was throwing together lunch one day for Ryan and I, I had a few things that needed to get used up: tortillas, some cream cheese spread, ham, and salami. I was going to make simple ham and cheese wraps, sort of like these Ham and Cheese Pinwheels, and then I realized I had a jar of pickles in the fridge too and thought I’d try combining everything together. You’ll start with tortillas. I used soft taco sized tortillas which are quite a bit smaller than burrito sized tortillas. 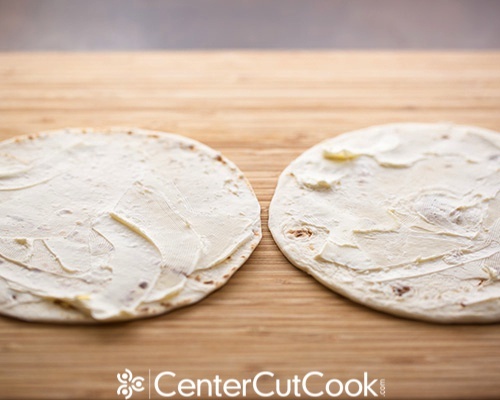 Spread a thin layer of cream cheese spread over the tortilla. I found that the cream cheese spread was much easier to work with than regular cream cheese. Arrange deli ham, salami, or whatever meats you’l like on top. This particular day I arranged salami on the bottom, then a few slices of ham. Top with dill pickles that you’ve drained. Rollup tightly, then cut in half, or in smaller one inch thick chunks. 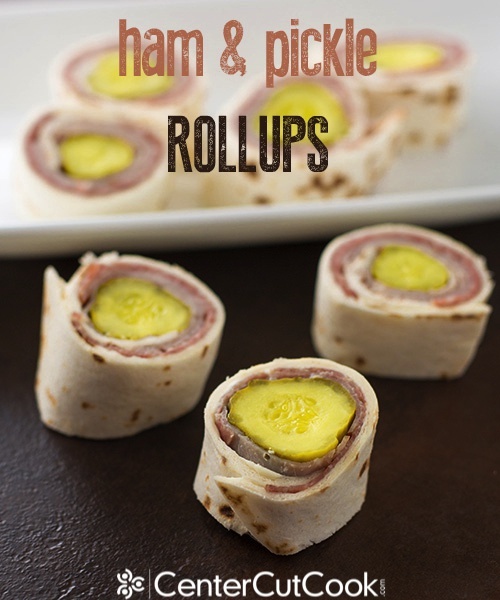 These ham and pickle rollups work great as an appetizer or snack, or even lunch! If you were serving them at a party, you could stick a toothpick in each to help hold it together. Let me warn you though, they are very addicting and will probably go quick! If you’re serving these for a crowd, keep that in mind and plan to make a lot! They may not sound very exciting, but trust me when I tell you, you’ll find yourself going back again and again for more! Arrange a few slices of deli meat on the tortilla. Place baby dill pickles across the width of the tortilla. If your pickles aren’t long enough, you may need two pickles to cover the entire length. Roll up tightly, then cut into one inch chunks and serve.